Some sites you access such as your Bank or work VPN probably have pretty decent security, so I'm not going to attack them. However, other sites like the Hallmark e-mail greeting cards site, an online forum you frequent, or an e-commerce site you've shopped at might not be as well prepared. So those are the ones I'd work on. Once we've got several login+password pairings we can then go back and test them on targeted sites. And how fast could this be done? Well, that depends on three main things, the length and complexity of your password, the speed of the hacker's computer, and the speed of the hacker's Internet connection. 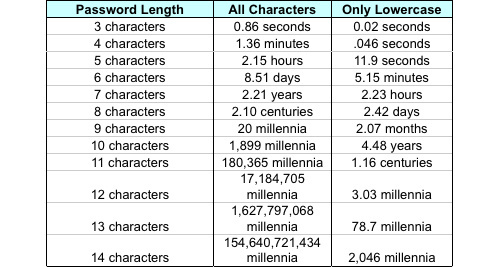 Assuming the hacker has a reasonably fast connection and PC here is an estimate of the amount of time it would take to generate every possible combination of passwords for a given number of characters. After generating the list it's just a matter of time before the computer runs through all the possibilities – or gets shut down trying. Remember, these are just for an average computer, and these assume you aren't using any word in the dictionary. If Google put their computer to work on it they'd finish about 1,000 times faster. Believe me, I understand the need to choose passwords that are memorable. But if you're going to do that how about using something that no one is ever going to guess AND doesn't contain any common word or phrase in it. Once you've thought of a password, try Microsoft's password strength tester to find out how secure it is. Another thing to keep in mind is that some of the passwords you think matter least actually matter most. For example, some people think that the password to their e-mail box isn't important because "I don't get anything sensitive there." Well, that e-mail box is probably connected to your online banking account. If I can compromise it then I can log into the Bank's Web site and tell it I've forgotten my password to have it e-mailed to me. Now, what were you saying about it not being important? 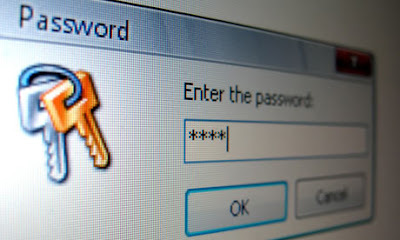 Often times people also reason that all of their passwords and logins are stored on their computer at home, which is safe behind a router or firewall device. Of course, they've never bothered to change the default password on that device, so someone could drive up and park near the house, use a laptop to breach the wireless network and then try passwords from this list until they gain control of your network — after which time they will own you! Now I realize that every day we encounter people who over-exaggerate points in order to move us to action, but trust me this is not one of those times. There are 50 other ways you can be compromised and punished for using weak passwords that I haven't even mentioned. I also realize that most people just don't care about all this until it's too late and they've learned a very hard lesson. But why don't you do me, and yourself, a favor and take a little action to strengthen your passwords and let me know that all the time I spent on this article wasn't completely in vain. Please, be safe. It's a jungle out there.